I came thundering to Alamogordo and the White Sands National Monument on Highway 70 from Las Cruces, through the mountains and military missile range. If you take this southern way, you will pass a border checkpoint where you have to declare your citizenship. It is a true desert highway: one night on this road at 2 a.m., I passed a pronghorn antelope sauntering insouciantly on the shoulder as my headlights briefly, surreally illuminated his black mask. 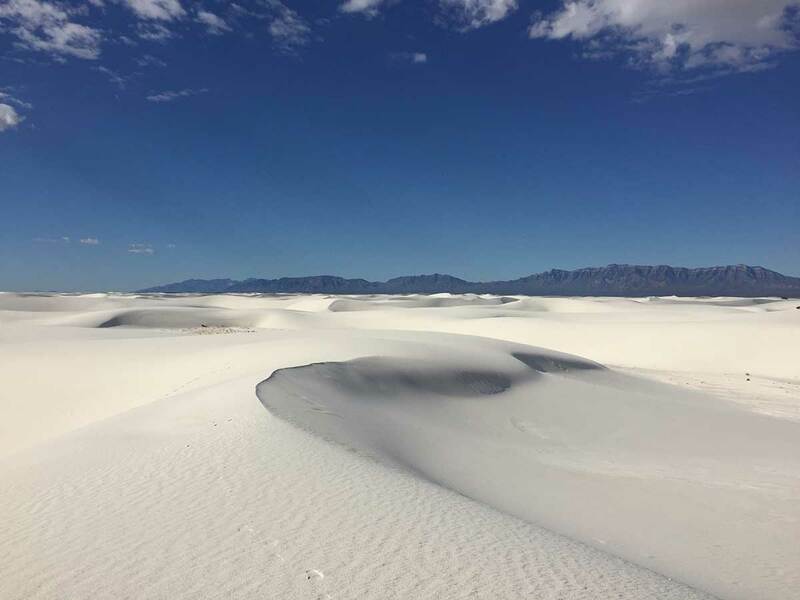 I have wanted to experience White Sands ever since I learned it existed. The first moment I caught sight of the shining white desert along the roadside, I whooped with joy. 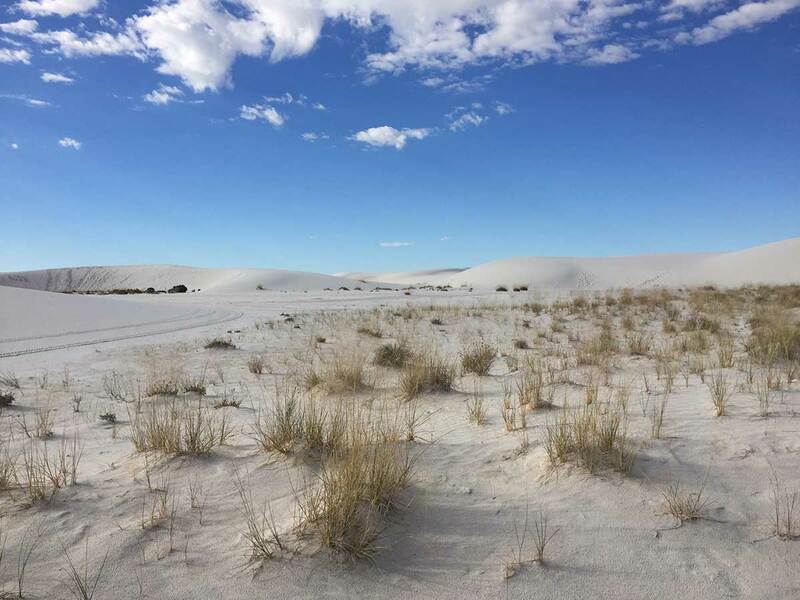 The white sands are a gypsum field, remnant of an ancient ocean. Around 275 million years ago, during the Permian period, a shallow tropical sea covered the region. As the waters rose and fell repeatedly over millions of years and evaporated in the sun, they left behind gypsum deposits. The gypsum eventually uplifted to become part of the surrounding mountains, which then, over many eons, eroded into sand, swept by the wind, gathered into vast, curving dunes. From the neon, retro White Sands Motel, I arrived at the park as soon as the gate opened at 7 a.m. I had just received a stunning email, a missive from a lover I thought I would never speak to again, who had abandoned me after I rashly gave up my whole life for him. I didn’t know how to respond yet, and I didn’t want to think about it—right now, the desert called. 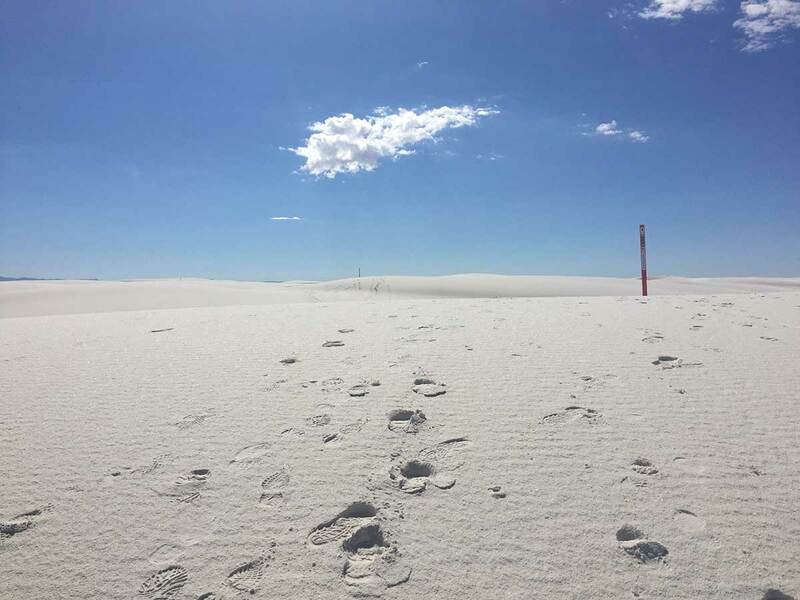 White Sands National Monument offers no water and no clear path. I was determined to get to the dunes early. Not knowing what the temperatures would be in late September, I didn’t want to get scorched. I also wanted to take advantage of the long light and shadows of the dunes. By the entrance is a sign that forebodes “No Water After This Point.” I was well outfitted with my stainless-steel bottle and a huge Ozarka bottle that I had bought at the Alamogordo Walmart the night before. Later, I would drink enough of it to hear it sloshing around in my backpack. I was headed to the Alkali Flats trail, the pièce de résistance of trails, where the giant dunes are, all the way at the back of the park. It is a trail warded by many admonitions of safety, so I was prepared to turn around at any point if it proved too much. Hiking into the dune field, you leave the broken terrain of the yucca and move into a region where nothing grows. The whiteness of the sand blasts and burns against the sky. Since the sand is all gypsum, it glitters. The animals of the dune field, especially lizards, have evolved to whiteness. I didn’t see any of these animals, if they were around. They were invisible on the ground, living ghosts. Walking the dunes alone is like being in heaven, or a dream. The sky is sapphire, cerulean, true blue, its burning intensity part of the purity all around you. As you dip beneath the crests of the dunes sometimes you can’t even see the border of the mountains. All the while the light shone and shimmered around me, glancing off trillions of particulate mirrors which reflected and refracted the light to something just this side of crazy. Hypnotized by my surroundings, I reflected on the email from that morning. What surprised me more than receiving it was that I even read it in the first place, with equanimity and curiosity, instead of deleting it. By doing so I realized I had already forgiven him—not out of any act of will but rather out of an organic process. Somewhere along the line, he had been forgiven. I carried this new feeling with me. I felt the weight of the karma I had borne him floating off me like armored plates, as I crested the dunes, strode in the shadows of their sculpted flanks. Footsteps in the sand—one of the few hints of life in the desert. Chani, I love you—I have always loved you. Walk without rhythm, and we won’t attract the worm. On the Alkali Flats Trail, red metal signposts are all that keep you from losing your way. At each post, you look for the next to guide you. Beyond the posts and the sand, the experience is an absolute aloneness with yourself, your water jug and your singing heart. At the halfway point, I took off my trainers to feel the sand under my feet. It was cool. On the powdery banks of the dunes, where the edges of my feet would carve the surface, it was even cooler. You can feel the water table that lives under the sand. I finished the rest of the loop barefoot, Sauconys in my backpack, delighting at the imprints my bare feet made in the cuneiform of footsteps of all the individual hikers. I could see which one was me. Sometimes I would spy other humans, miniature figures so far off I could neither hear them nor ever catch up to them. Then they would vanish, fellow souls in this heavenly place. I only met one other hiker, as I was nearing the trailhead: he was initiating the trail going the opposite way of me. In the noon sun, he was blinking his eyes against the light of the desert. I laughed, and greeted him.